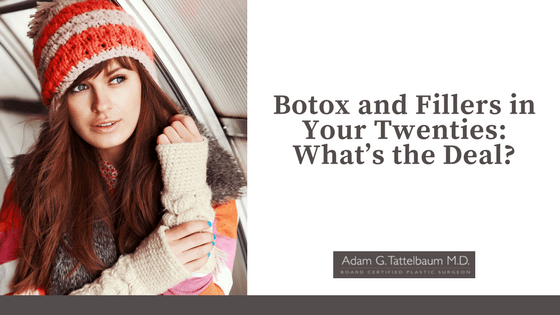 Home » Blog » Botox and Fillers in Your Twenties: What’s the Deal? Botox and Fillers in Your Twenties: What’s the Deal? As we now live in an era that stresses self-image above almost anything else, how you look has never been so important. According to a survey from the American Society of Plastic Surgeons, 64% of members stated they had seen a dramatic increase in patients under the age of 30. All of these younger patients had requested facial cosmetic surgeries or fillers. Image is important in the millennial generation, but is the new candidate for cosmetic surgery someone who has just turned 21? Although typically women in their 20s do not have visible wrinkles or start to show creases, their curiosity for Botox has only increased. But does Botox make sense in this young age group? If it’s not treating wrinkles, can it really prevent them in the future? Some plastic surgeons say yes, but it is true or is it just marketing? Now that you have the choice to “defy time” and reduce the appearance of age, it almost seems less like a choice and more like the norm. Anyone with a social media profile wants to look their very best. This could mean repairing sun damage, wrinkles, small lips, shallow cheekbones, or something else. Young people love social media. Sites like Instagram and Facebook are pushing the conversation when it comes to plastic surgery. Things are more accessible than ever before. This has led to the Millennial habit of instant gratification, where you no longer need to wait to receive what you want. Whether it’s social feedback, a new tan, or simply an urge to eat or drink, we can obtain it right away. This is especially true for popular plastic surgery procedures. This is where Botox comes in. With the advances in technology, there are no limits to what you can change, and how quickly you can make that change happen. Whether you don’t like the bump on your nose or wrinkles under your eyes, you can easily get rid of them. While browsing social media, many promotional campaigns will urge individuals to enhance their image. As these campaigns effectively attract their market by highlighting that these procedures are easy, effective, and quick, everyone is encouraged to book their session. Botox, or technically botulinum toxin, paralyzes muscles. It is the muscles in our face that make us frown, pucker and have facial expressions. When facial muscles are at rest, the overlying skin tends to be smoother and wrinkle-free. When the muscles contract, the overlying skin wrinkles. These are called dynamic wrinkles because they are only there when the muscles are working. If a patient doesn’t like some of the dynamic wrinkles, Botox can help weaken these underlying muscles. An example would be Botox near the corners of the eyes to soften the wrinkle lines there (i.e. crow’s feet) when smiling. Some patients will have some wrinkling even when the muscles are not fully contracting. So even at rest, there will be some activity causing wrinkling. Botox may inhibit that resting tone and soften it. A good example would be someone who looks like they’re frowning while they are not. Static wrinkles overly areas where there is no muscle tone. Botox will not make a difference here because the muscles are not the culprit. In truly static wrinkles, skin tightening or fillers may be a better option. Millennials, if they fall into any category, are most likely to fall into the first and second categories. So if millennials use Botox for dynamic or partially contracting muscles will that actually prevent or slow the progression of wrinkles in the future? People develop wrinkles as their skin gradually weakens and is no longer be able to “recoil”. This can be caused by smiling, frowning, laughing, and all other facial expressions. By starting Botox early, we may be able to prevent the early signs of wrinkling and its progression. While some experts agree that getting Botox done at an early age will reverse any minor lines, and may prevent them from coming at all, it is not 100 percent clear and only time will tell. There are many reasons skin can age beyond what Botox can treat. Sun exposure, smoking, and genetics can all play a role. For Millennials, I don’t mind offering Botox when I feel it would make a difference. It is low risk and wears off if the patient doesn’t like the outcome. In that age group, it will most likely be effective for specific dynamic wrinkles. Will it actually prevent future wrinkles? Only time will tell, and it is important to me, to be honest about that. No one can completely fight their parent’s genetics, but it is equally important to me to point out even simpler methods to combat future wrinkling such as sunblock, skin cleansing and moisturizers. The sun’s rays make a huge impact on wrinkling, but it hard to tell a Millennial not to get an awesome tan on vacation. The stigma of getting Botox young is fading. It is only normal that young individuals want to take care of their skin before having to use more aggressive procedures in the future. Starting to use fillers or undergoing Botox procedures does not mean weekly sessions or an addiction. It only means resolving visible skin issues and possibly preventing future wrinkles or lines in the correct candidate. Whether you’re looking to get fillers or Botox in various areas of the face, Dr. Adam Tattelbaum can help you achieve your goals. Don’t hesitate to take the first step. Schedule your consultation now.